Twitter guys will soon be coming out with a new impressive feature called 'Lists'. This feature will allow users to group various Twitter accounts, by creating their own 'Lists'. Users will then be able to keep track of these 'Lists' as well as manage them. 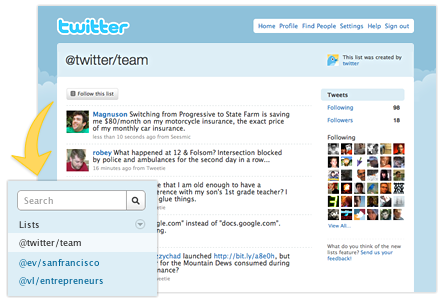 For example, you can create and manage lists of the Twitter accounts of your friends, of celebrities or of anything you desire of. 'Lists' will be made public by default, but will also have provisions to make them private. The 'Lists' created by you will be linked to your profile and other Twitter users will be then able to subscribe to them.
" We started working on this feature because of the frequent requests we received from people who were looking for a better way to organize information on Twitter. Of course, that means not just twitter.com—the Platform team will follow up in a few days with information on the Lists API. This will allow developers to add support for Lists into your favorite Twitter apps." - said Nick Kallen (@nk), the 'List' project lead, on the Twitter blog. Currently this feature is being tested with a small subset of users, and will soon be launched for all accounts. Read more about it here on the twitter blog.